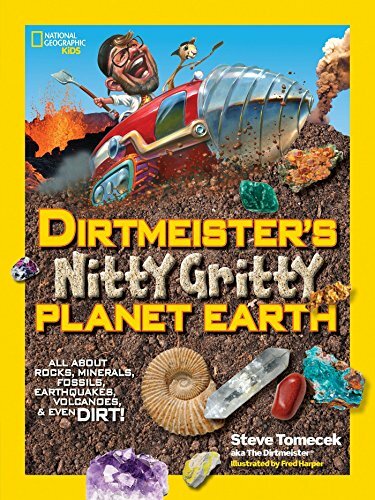 a book review by Robert Schaefer: Dirtmeister's Nitty Gritty Planet Earth: All About Rocks, Minerals, Fossils, Earthquakes, Volcanoes, & Even Dirt! The principal character in Dirtmeister's Nitty Gritty Planet Earth is the author himself, aka The Dirtmeister. The book’s cover shows The Dirtmeister driving a mechanical hole-tunneler; there is a volcano in the background, the foreground is superimposed with gems and fossils. Inside, the text font type and size varies; words and phrases are brightly colored as if highlighted by a student studying for an exam. The Dirtmeister’s pal is a cartoon gopher that talks. Manga-styled children “phone in” from around the world asking science questions. There are experiments that can be done at home under adult supervision that are easy, fun, and much safer than say, the experiments from The Chemistry of Alchemy by Cathy Cobb, Monty Fetterolf, and Harold Goldwhite, previously reviewed at NYJB. It’s as if an educational TV cartoon series has been reimagined as a comic book. But don’t be fooled, despite the cartoony fun, Dirtmeister's Nitty Gritty Planet Earth has a serious message. Chapters cover the origin of planet Earth, rocks, crystals and minerals, earthquakes, plate tectonics, natural erosion, the rock cycle, archeology, soil, and Earth’s natural resources. The text is richly illustrated, including illustrations of the Earth’s interior layers; there are photographs of the destruction wrought by earthquakes, of modern scientific and reproductions of ancient instruments. Dirtmeister's Nitty Gritty Planet Earth also provides biographies of scientists, including Charles Richter, Frederich Moh, Marie Curie, Maurice and Katia Krafft, Andrija Mohorovicic, Marie Tharp, Bruce Heezen, Hammond Hess, Alfred Wegener, and Florence Bascom. Dirtmeister's Nitty Gritty Planet Earth also includes fun facts; for example, did you know that the longest mountain chain on Earth is on the bottom of the ocean? And did you know that archeologists don’t dig randomly but use earth-penetrating sound waves to find potential places to dig. The question as to whether Dirtmeister's Nitty Gritty Planet Earth “teaches to the controversy” (the euphemism for the science / creationist divide in K–12 education), this reviewer found this book avoids the controversy, except in the chapter on archeology, where the author acknowledges that many people still do not believe in evolution. Of interest to those who care about ecology, for example the side effects of pesticides, the consequences of strip-mining and the fact of global warming, these subjects when addressed at all are but lightly touched. This reviewer could not find the terms “ecology, “environment” or “conservation” in the index. Given the intended audience (grades three through eight), this reviewer accepts that the science must be simplified, and the coverage must be broad if not particularly deep; however, National Geographic Kids publishers and author Steve Tomecek, could have, should have, done better with respect to conservation of the Earth’s natural environment. Despite the caveats, Dirtmeister's Nitty Gritty Planet Earth is well organized, with a balanced mix of cartooning and seriousness. Stephen Tomecek and Fred Harper together succeed in making Earth science fun.